The Vulcan 1600 Classic and VN1600 motorcycles share more than just the powerful “K” logo, they share saddlebag designs, as well. 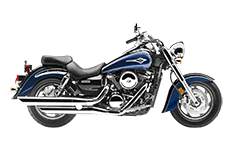 Industry leader Viking Bags has created a lineup of saddlebags specifically for these two Kawasaki 1600 bikes, and riders of all preferences and styles can find exactly what they need here in our online catalog. No matter if you're a daily commuter or long-distance traveler, these heavy-duty bags will take you farther than you ever expected. Browse through our collection and see the differences for yourself!